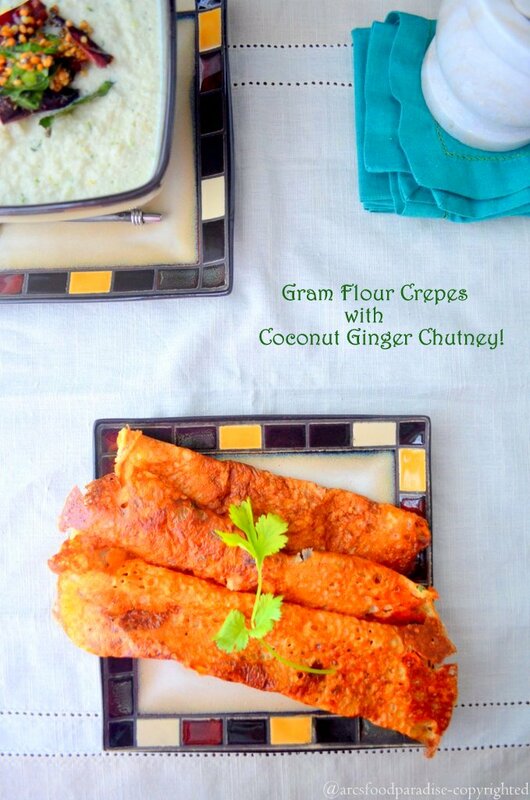 Besan Chilla (Gram Flour Crepes) with Coconut-Ginger Chutney | The Flavor Nook! The first things that come to my mind at the thought of a traditional Indian breakfast (or rather south Indian breakfast) are ‘Dosa’, ‘Idli’ and ‘Vada’. Back in school and college days, Mom used to make these on a rotation basis….dosa this week….then in a couple of weeks…idli….then vada and so on each with versatile dippings – peanut chutney, tomato chutney, coconut chutney, sambar and every time I would gulp them down ardently. These are some dishes I would never ever get bored of! 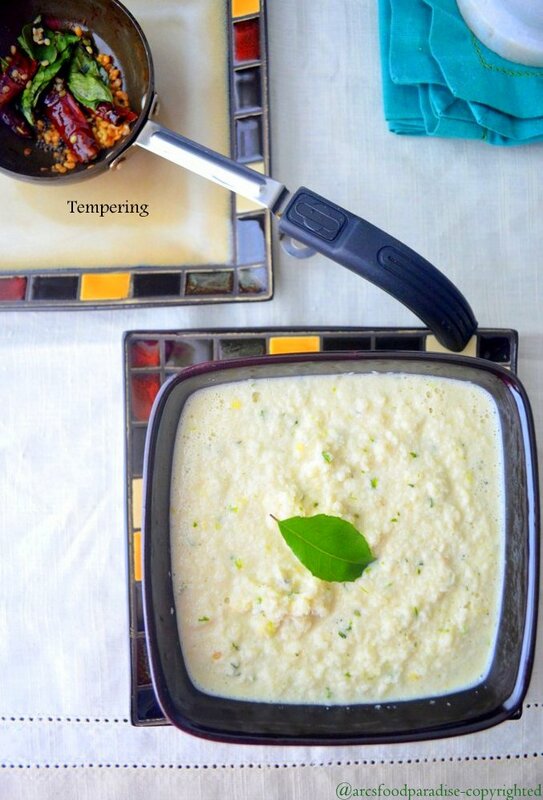 When I got to cooking after getting married, I realized making these traditional breakfasts are time-taking and it needs a bit of planning – soak the dal/lentils the previous day, store in a warm place to let it ferment, grind into a smooth pasta and then finally get to making them. It doesn’t end there….make a chutney and/or sambar to accompany them. So, earlier this week when I suddenly remembered about a quick version of dosa/crepes which my mom used to make….I immediately called her for the recipe. These dosas/chillas/crepes are so quick to assemble, all you need to spend time on is a chutney to go with it. So, I made these ‘Gram Flour Crepes’ with tomato puree, green chillies and shallots. I added tomato puree to replace a part of water as it infuses a nice flavor to the crepes. You could instead finely chop them and add to the batter. 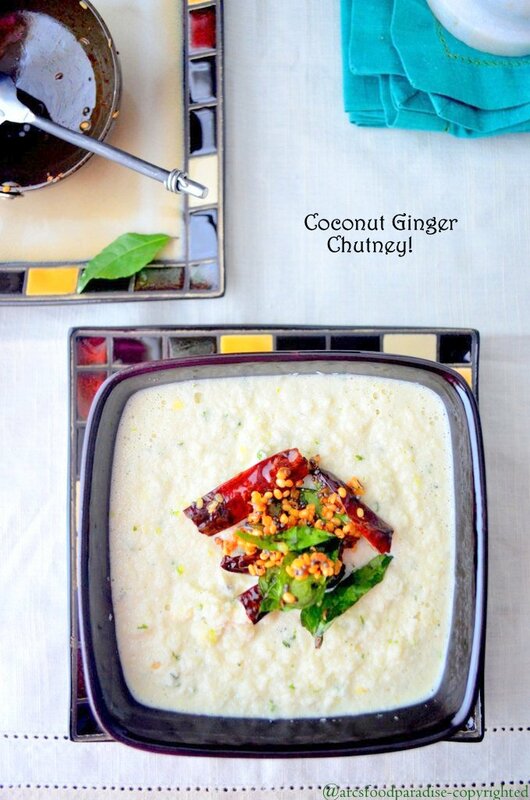 For the chutney, I made this nice, flavorful and aromatic ‘Coconut Ginger Chutney’. For this chutney, using fresh coconut and stone grounding will yield better results but I worked with what I had and it did come out really tasty! – Semolina is added to the batter as it is coarse and makes the crepes nice and crispy. 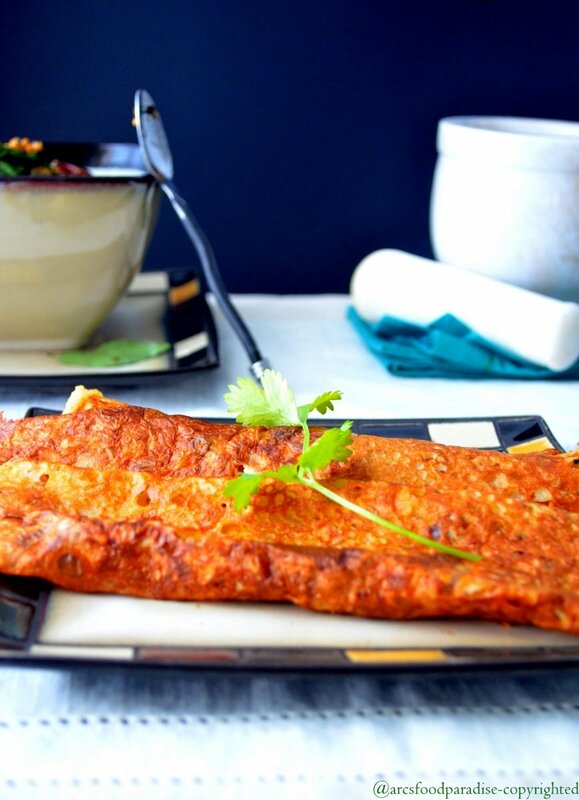 – The dosa pan should be ‘hot’ in the sense that you should hear a sizzle when you put the batter on it. Else the dosas don’t come out crispy. – Onion is used to rub over the pan as it serves 2 purposes – nicely spreads the oil all over the pan and gives a nice flavor to the dosas/crepes. – Don’t remove the crepes onto a closed dish, because the steam circulates inside the dish and makes the nice and crsipy crepes turn soggy. So best it to serve them as you make it! 1. In a mixing bowl, take 2 cups of gram flour, 3 Tablespoons of semolina, a cup of tomato puree, finely chopped shallots/onions and green chillies, cumin seeds. Add salt and give everything a nice mix. Now, add about 3 to 4 cups of water and mix until the batter is of a dosa/crepes consistency. 2. Heat a non-stick pan or cast-iron dosa pan. Add a tsp of oil to the pan. Cut an onion into half and using a fork (else you’ll burn your fingers) place it’s flat side on the pan and rub it over the pan. Now, take ladle with batter and put it onto the pan. Spread evenly and drizzle another tsp of oil through the sides of the crepe. Let it stay for a minute or two until it is palely brown, flip for a minute and remove onto a plate. 2. 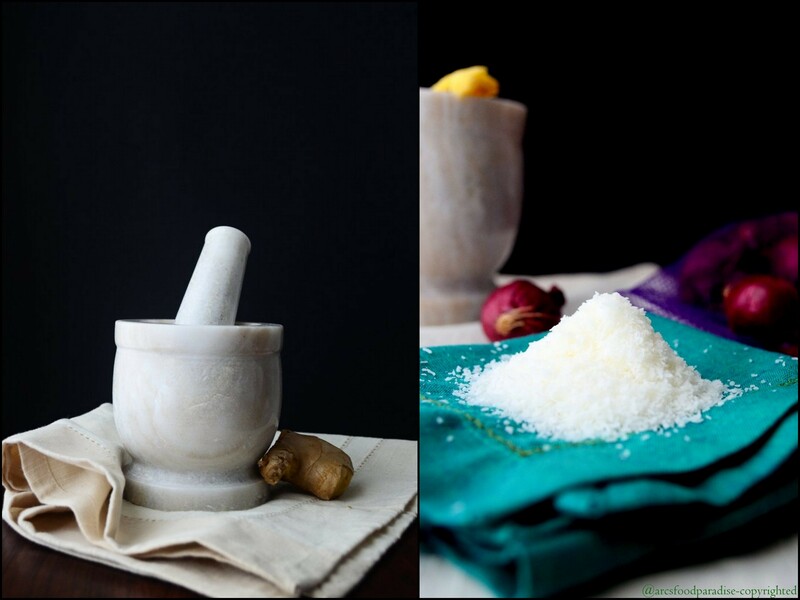 Soak a tiny piece of tamarind in 1/2 cup of water and heat in microwave for 30 secs. Squeeze out the tamarind juice, discard the pulp and set aside. 3. Take the sauteed mixture into a blender, add about 3 to 4 tsps of tamarind juice, ginger, garlic, cilantro leaves and salt. Add a cup of water and blend into a smooth paste. Check the taste and adjust salt if needed. Remove into a serving dish. 4. In a small tempering pan, heat 1 tsp of oil. Add cumin seeds, mustard seeds, urad dal, dry red chilli and curry leaves. Saute for a minute or two and add it to the chutney. Enjoy these crispy gram flour crepes with coconut ginger chutney for a filling brunch, breakfast or even an early dinner! thank-you!….you must give this a try….you’ll love it! Loved it! great pictures too Archana!